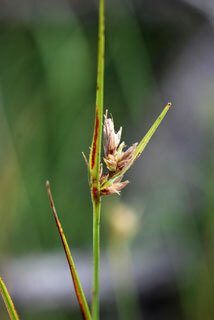 Also Called: Whip razor-sedge, tall nut-grass, whipgrass. Culms: Erect to ascending, strongly triangular, stout, glabrous, angles rough. Leaves: Flat, linear, 2/5 to 12 inches long, 1/8 to 2/5 inch wide, shorter than culm, stiff, rough, ribbed, glabrous or slightly pubescent on veins below; margins rough, sometimes slightly pubescent; tip abruptly tapering to point. Sheaths: Not winged, glabrous or minutely pubescent, often tinged purplish. Ligules: Rigid, glabrous or hairy. Inflorescences: Head-like clusters of spikelets, 1-3, 3/5 to 1.6 inch long, 1/5 to 3/5 inch wide, terminal and in leaf axils; involucral bracts erect to ascending, leaf-like, elongate, lanceolate, 1 to 6 inches long, exceeding inflorescence, fringed or glabrous; tips tapering to long points. Spikelets: Brown, 1/8 to 2/5 inch long; 1-flowered pistillate spikelets usually distributed among clusters of staminate spikelets; staminate scales lanceolate, tapering to points, green to purplish-brown; pistillate scales ovate, midrib prolonged into short awn; stamens 3. Fruits: Achene, nearly spherical to egg-shaped, 1/12 to 1/10 inch tall and wide, smooth, shiny, whitish , situated on low, ring-like structure (hypogynium); hypogynium somewhat 3-lobed, covered with rough, white crust; achene tip usually with minute point. Habitat: Sandy prairies, sandy open woods, ditches, meadows, swales, rocky disturbed sites; sandy soils. Distribution: East third of Kansas and McPherson County. Comments: The stems are usually clustered in tufts.